Germany further eases the rules for employment of the citizens from the Balkan states. This is another indicator of the German demographic situation and the falling number of available (skilled) workers there. Just like in the middle of the siege of Sarajevo, Bruce Dickinson paid a visit to the city. Starting from this, there are a couple of related videos on sleep, what happens in the brain during sleep, and on the natural sleeping patterns. 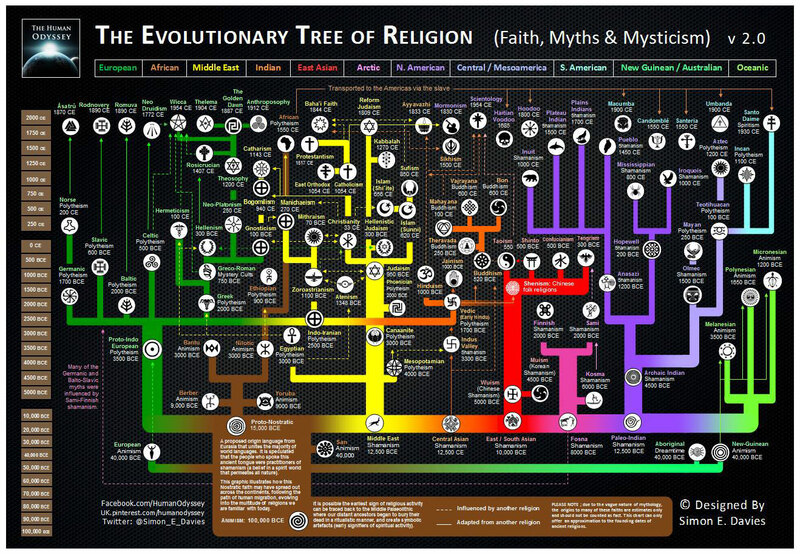 Thanks to @DJakovljevic and @Simon_E_Davies, here is a tree chart of world religions. "Happiness is not the absence of problems, it's the ability to deal with them"
Lots of interesting books. Found the site through search that led to A Primer on Communication Studies, more specifically - nonverbal communication. Eupedia has a decent section with genetic maps of Europe. 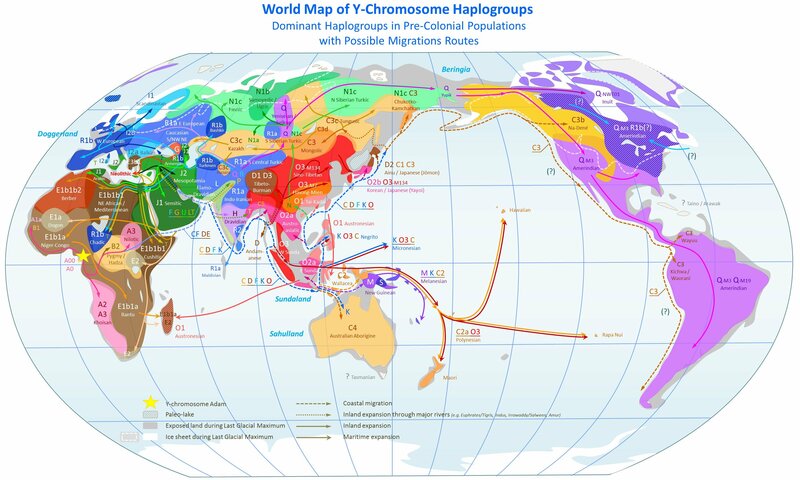 These are divided into paternal (Y-DNA) maps and maternal (mtDNA) maps. For me, the interesting group to follow is I2a1, shown below. It is a base for a theory of the oldest known inhabitants of Europe, from the last ice age. The concentration is the highest in the Balkans mountaneous area. More significantly, it also proves that there really is no difference among the many nationalities in the region who were involved in bloody conflicts throughout known history. I love the koan about the finger and the dog. In any case, this current development of relations was to be expected, in a way. Al Qaeda was not a much better example. The link below contains a great summary of Dr. Rick Brinkman's quadrant for understanding the types of behaviour and their approach. The end of the article contains the scheme used to understand the type of behaviour while the whole text above explains each of the types. More on the topic in the book "Dealing with difficult people". Quite an interesting topic. The book handling it certainly deserved the title of the Book of the Year. To solve this, we might need an algorithm (a robot). World Bank puts the country into the Upper middle income group (link). Well situated compared to the rest of the world. Salary Explorer (link) shows the average monthly salary in Bosnia to be ~1,300 BAM and median 1,200 BAM. This is €650 and €600, respectively. Of course, to even get to this survey, one would be educated enough to know English, have an access to the computer, *and* be employed, all at the same time. Quite a feat, considering that almost the third of those who are able, actually do not work. Another survey (link) states that 25,000 BAM is the most common salary. This is clearly expressed on an annual level, making it higher than 2,000 BAM per month. Phew! Again, only 71 correspondent there so hardly a representative sample. Xinhua reported in 2014 that the average salary in Bosnia was €422 (link). The negative side is that this was 1.4% less than the year before. Index Mundi (link) has a generally good collection of statistics. It is great that the GDP doubled since 1998, making it to US$ 9833 in 2014. The rest of stats - link. It's been years and I still can't get this image out of my head. Following an interesting tour in the Vienna Museum, and finding that on the top of the St.Stephen's tower (the famous Stephansdom) there used to be a crescent and a star until the second Otoman siege of the city in 1683, this symbol looked quite interesting for further investigation. Wikipedia, as usual, contains excellent information on history. In addition to this, there is an interesting text titled The six pointed star and the crescent, that describes some history behind the symbols. This is now an official The Pirate Bay song. Wonderfully done. Quite educational with significant new insights. Plus it was great seeing Melbourne again. Even if only on the big screen. Another useful reference from the film is a book Salt, Sugar, Fat - How the Food Giants Hooked Us. Here is a 10-minute part of Dr. Oz with some additional information. A breakthrough has been demonstrated that would allow creation of Lithium-air batteries that would have five times larger capacity than the best batteries in use today. This would mean either batteries five times smaller or batteries with five times more energy stored. In any case, if this works out I'm looking forward to having smaller mobile phones (again) as well as finally getting that electric motorcycle! My favourite is RED #40! Ena Kadic, former Miss Austria, died in hospital after an accident in Austrian Alps. She was born in Bihac, Bosnia and Herzegovina (former Yugoslavia). Beautiful presentation on creativity, technology, and programming. I haven't seen something this good and important in a while. Explains the role of technology today. Please watch, share, and apply! This also explains why I love my profession so much that I spend a lot of my spare time doing the same thing. Learning to code is such an important feat in the 21st century. A whole new world opens up once you learn to create something. The beauty of Open Source, and the licensing models that sprung in the recent years, is that there are so many projects out there that you can use, borrow ideas from, or contribute to, or link together and create something new. Platforms like GitHub, which stores source code for free, enabled an explosion of exchange of ideas, concepts, and solutions available as source code. Knowing how to read and write this code is becoming increasingly important. The implementation is the most exciting part. Even if you are not a professional programmer, you can still write the code that does something useful for yourself. There are hardware platforms like Raspberry Pi, or Android and other PCs on USB sticks, or simply common phones and tablets. Many of these are increasingly available for under $100 and are more capable than a machine that landed humans on the Moon. You can also contribute to existing projects and add to ideas and solutions already implemented. A wide field of options opens up once you start. The numbers are not reliable, however, so don't expect to use them for the long-term. Here's a different view on Syria. It gets much more complicated than is visible from the Western news and the focus on side-effects. Seeing the recordings from the place very much reminds me of scenario that was unfolding in Bosnia in the 1990's, which I happened to experience first-hand. At 11:11, excellent comment on Islamic fundamentalism. It is impressive to see so many participants from Austria, considering it's geographical size. Obviously, the sphere of influence is not that small. Just watching Syria: The Last Assignment, a footage taken among the rebels in Syria: Free Syrian Army, Al-Tawhid Brigade, Al-Nusra Front, Ahrar Al-Sham, and ISIL. Unfortunately, cameraman Yasser Faisol al-Jumaili's last assignment. One version of the film can be seen online at Al Jazeera (link). Once you already have a flu, there is not much you can do. But some remedies are universal - chicken soup and ginger tea. Prevention, as usual, is the best medicine. Here's something very practical. Scientific facts about flu. Out of the collection above, here is a documentary on the second siege of Vienna in 1683. Now I can finally learn more about this piece of history of European civilization. Pay attention to the #12. "Act disgusted if the waiting time is more than 3 minutes"
I’ve read that over $1.2 trillion of scheduled Big Oil investments have been delayed or taken off the table. The majors have a depletion problem. They have to find new oil, and in size, to be able to make up their losses from reduced production from older fields. While small, independent companies can do very well drilling 10 or 20 wells at reduced costs, the majors need to find huge “plays,” which are typically in inhospitable places and cost more per barrel to pull out of the ground. $50 oil just doesn’t cut it. Someone is going to eat those losses. Depending who it is and how big they are, we could see some sizable energy industry defaults and bankruptcies over the next year. There’s an outside chance the spillover could affect some hedge funds and make them unwind other positions. That’s how you get a “contagion” going. The core of good business is to sell something people need. But successful business is the one that manages to artificially create that need. 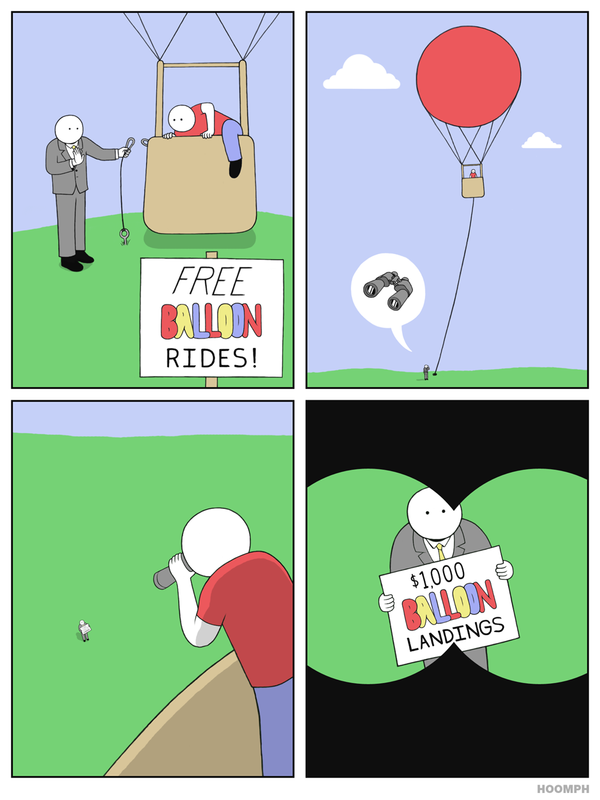 The comic below illustrates how this works. Coincidentally, this whole concept is described in the latest book by Nobel laureate Robert Schiller and George A. Akerlof, Phishing for Phools. The point being the quesion whether the artificial creation of this need is ethical. For reference, here is a description of phishing for those not familiar with the concept. This is well portrayed in the movie The Wolf of Wall Street with the example of selling a pen. How to do it right, and how not to do it. Guess I've missed the sight later at night but the Moon did appear unusually larger! Currently, my favourite from that list would be Lenovo P70. If the default graphical UI of the installer does not allow for customization of the destination path for installation of Visual Studio, there is still a way to adjust it. Visual Studio (in this case 2013) installer accepts command-line parameters. /CustomInstallPath parameter (reference) should help in this case. Here is another useful utility - TaskKill, which can kill (/im /f) all instances of the installation executable in case it starts multiplying own processes. In attrs.xml, define an attribute that references an item in a theme. Add a line, i.e. Then, based on the selected theme, the R.attr.calculator_button_background or ?attr/calculator_button_background will reference the colour defined in themes.xml. While Visual Studio 2015 is the next product version in the line, Visual Studio Code is a surprise. Fast start, MarkDown preview, syntaxt highlighting and intellisense. Seems like a great text editor. Currently in preview version and free. Somebody clever at Adobe forums has found an easy way to disable the annoying Tools panel in the new Acrobat Reader. The product, btw, is now called Adobe Acrobat DC and offers some neat cloud integration so that you can see your documents across different devices. This probably means that any file you open goes to the cloud so beware when opening confidential documents. Go to the install directory, i.e." C:\Program Files (x86)\Adobe\Acrobat Reader DC\Reader\AcroApp\ENU". Create a new subfolder (I used "Disabled"). Move 3 files from the "ENU" folder into the new "Disabled" folder: AppCenter_R.aapp & Home.aapp & Viewer.aapp. Open a PDF and no more Tool Pane! I originally moved just the "Viewer" file but if you clicked on "Home" or "Tools" on the toolbar you couldn't go back to the "Document." Moving all 3 files takes care of that issue. On a positive note, the new Reader is very fast when opening documents and is a welcome upgrade to the previous version. Android version, on the other hand, takes a bit longer to start. This is particularly useful on tablets with limited space on system drive. There is a scheduled task in Servicing folder, that cleans up the WinSxS automatically. Running Disk Cleanup Wizard will run the above task, too. Console command for the above is "Dism.exe /online /cleanup-image /StartComponentCleanup"
/ResetBase ("Dism.exe /online /Cleanup-Image /StartComponentCleanup /ResetBase") removes all the superseded versions of files, which prevents uninstalling updates but also saves quite a bit of space. Check space used with "Dism.exe /online /Cleanup-Image /AnalyzeComponentStore". While vector graphics implementation is moving quite slowly, there is another interesting development in the similar direction. The point in question being avoiding multiple different sizes of images and using one image that scales well. This can be achieved only with vector images and, as mentioned, direct support for SVG is quite slow. The alternative is coming from the world of web applications. Font Awesome, for example, is a great way of using a custom font that contains icons instead of letters. That way, icons can be drawn anywhere in a very simple way. They scale well, and their colour can be customized. They are monochrome, with one colour available for the icon content and, being usually transparent, another one is available as the background colour. This is quite enough for most purposes. It is very light on resources and easy to implement. Here are a few links to articles and the library that allows the same for Android apps. The implementation is quite easy and this represent the easiest way to use scalable graphics in Android apps so far. Handy if having multiple operating systems installed. Wickr is one of the better solutions in the wave of safe messaging platforms appearing as of late. Picasa, Google+ Photos have finally evolved into an independent site that only handles your photographs. The desktop and mobile apps can back up your photos automatically and the capacity is unlimited as long as you keep the photos at certain size. This is not a bad option but I still believe Flickr is a decent competitor. Sharing is still on Google's side because of integration with Google accounts. Introduction course to Universal Windows Apps. Shrinkwrap command allows specifying which package versions to use. Often there is a mess when upgrading one package in a chain, or (trying) migrating from Node to io.js, when one package doesn't work and brings down all the others that depend on it. Here is an Android Emulator for desktop machines, that claims more features than the other existing emulators out there. It is free and worth trying out. Wonder how many developers actively use instance methods - apply, bind, and call. Edit 2015-03-30: I see from other sources that TWRP 2.8.6.0 could be too big for recovery partition on I9300 so beware! After flashing the latest TWRP with Flashify, the phone fell into a boot loop. Here is a list of recovery procedures performed in case I need them again. So, first I used a USB stick modem to get Internet. SIM extender or an original remains of the card were needed to fit the SIM card into the USB modem. Then, via PC, I flashed TWRP with Odin, using PDA option. This fixed the recovery and the phone booted into OS. However, the phone would not connect to network. The baseband was unknown and IMEI did not show up at all when trying with *#06# code on the phone. The solution for this was to flash the modem. Extract the files to get modem.bin. Download img2tar tool from xda. It is also possible to use Tar for Windows but this is safer as it generates md5 hash as well. Flash the resulting modem.tar.md5 file using Odin, via Phone option (not PDA). This is with Odin 3.07. This fixed the baseband and the phone correctly recognised that there is no SIM card. Great article on mechanics of launching of Android apps. If you were annoyed by the blank screen that shows up before your app starts, here are a few tips on how to make it look good. The article below lists several locations that contain files that NVidia Network Service piles up. These can amount to gigabytes of junk files. Even though I have the latest drivers installed, the network service still downloads about 10 versions in the past. Needless to say, there is no setting to prevent this. My solution was to disable the network service and occasionally check for updates manually. Another Google service is shutting down. This is becomming a recurring story. A source-code-hosting service Google Code is due for burrial. On the positive side, the service was OK but never got any big popularity. It was surpassed by the likes of SourceForge, BitBucket, GitHub, even Bazaar or Visual Studio Online. If they (Google) continue like this, soon there won't be much to use of them at all. Their new products are failures and the successful ones are getting killed by the company itself. Wonder what this will turn to. Here is a new messenger that drops most of the limitations of other chat apps. It has me interested so far and warrants some time to try it out more thoroughly. This would be quite an interesting development, if it materializes. Fantastic site with lots of interesting stuff to read! PC Magazine tests free version of antivirus products. BitDefender still tops the charts. No replacement needed for now. Nexus 7 2013, WiFi, users rejoice.